As an individual who uses laptops on the go a lot, it is important for me to have a device that is light enough to carry, but has a screen that is large enough for my needs. I have found that many of the larger laptops tend to feel heavier on my back throughout the day, so I decided to pick up a 14 inch laptop that is perfect for my needs. Since I write on a daily basis, it is important that I chose a laptop that fits my needs for both work and entertainment. I want a smaller sized screen, but I don’t want to sacrifice quality to get it. With all of this in mind, which models on the market today are the best 14 inch laptops? Before we look at a few specifics, let’s look at the features that you want to have in your new device. I hope there’s no need to explain the importance of a fast processor in a laptop. It’s the cornerstone of any lag-free laptop. For most, i3 and i5 is best for light work and travel. i7 are most suited for gaming and high-performance laptops. Though, that doesn’t mean that Intel i7 are always faster than i5 CPUs. For example, i5-7300HQ is faster than i7-7500U. H-series processors are performance oriented and U-series models prioritize a battery life. The best of both worlds right now is i7-7500U. Go for SSD. Just do it. You’re a gamer and you have to choose between a dedicated Nvidia GPU and an SSD – and you don’t have enough money for both. Then go for a dedicated GPU. Being a writer, I need a laptop that I will be able to use for hours without worrying that I need to plug in. When I meet with my clients, we typically meet at a Starbucks, which means that when the meeting is over, I tend to hang back a bit so that I can focus my thoughts and get a rough template down for the project that I am about to begin. Finding an available outlet can be a challenge, so I need to have a laptop that can accommodate my needs. If we measure battery life with Wi-Fi and light work, 14″ laptops range between 1 and 14 hours with 6.5 hours being the median battery life. Don’t mistake it for being the same as the advertised battery life. Those are usually 1-4 hours higher than the “realistic” battery runtime. 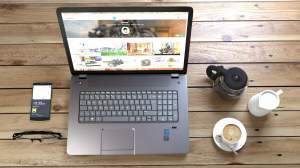 One of the main reasons that you are trying to decide which devices are the best 14 inch laptops on the market is that you need something relatively light to carry around. I am always on the go, so traveling to meet up with clients can become difficult when you are carrying a “brick” on your back. Having a laptop that weighs less than 6 pounds is a necessity for someone who will be using public transportation as their main form of travel. In fact, I prefer something even lighter when it is possible. 14″ laptops range between 2.2 lbs (1.0 kg) and 5.4 lbs (2.4 kg) with 3.8 lbs (1.7 kg) being the median weight you should expect from a 14″ notebook. Getting enough computer memory (RAM) is critical. At the same time, if you just get 8 GB of RAM, you’ll be OK. If you’re a gamer or you multitask a lot – then 16 GB can be a worthwhile investment. But for most – even 8 GB will be enough. Still confused? Check out this guide to help you determine the amount of laptop memory you need. I am a gamer and I like knowing that I can fire up a something to play around even if I don’t find that much time to play these days. This means that the device that I select needs to have at least a mid-range discrete video card. If I was buying a new laptop right now, I would aim for GTX 960 or GTX 1050. Both of them offer good enough performance to play all the latest titles but they’re not good enough to go beyond Full HD resolution or drive VR gaming. For that, GTX 1070 and 1080 are the only real options, though they’re not as easy to find in a 14″ laptop. If you don’t need to work with graphics and you don’t care that much about accurate colors while watching movies, you can entirely skip this requirement. But if you care about the display, I recommend making sure you get a laptop with Full HD resolution which is usually plenty for a 14 inch laptop. There isnt’ much of a need for a 4K resolution in a 14″ computer. Also, if I’m looking for more than just a budget machine, I’d make sure I’m getting a laptop with an IPS panel. It improves viewing angles and color contrast. Having a smaller laptop will make it easier for you to write during your commute. The leg room in an airplane seems to be getting smaller with every trip that I make, so having a smaller, 14 inch laptop means that you will be able to type comfortably. These laptops still need to be checked by TSA, so if you are unaware of the regulations for laptops, check out the laptop bag procedures that have been set forth by the TSA. If you’re looking for a relatively low-cost 14-inch laptop, then this Asus laptop is a great sub-$700 option that has a lot of great features. This device does not a has plenty of storage space (750 GB) but there’s no SSD. That’s not ideal but considering other specs, it can be forgiven. It’s also relatively light at less than four pounds so trucking it from place to place is really easy. While this machine’s processor isn’t the best, it does get the job done. With a dual core setup on its i7-5500U chipset, you shouldn’t have any issue with most applications. The biggest issue with this particular laptop is its battery charging; simply put, it charges very slowly when it’s plugged in, which is somewhat odd and VERY inconvenient if you have to go out quickly. These days, the 2-in-1 is becoming increasingly popular. While the Lenovo Flex doesn’t fully detach from its keyboard, it does convert so that you can use it in a more tablet-like style. In my opinion, the chief feature of this laptop that is most impressive is its amazing 16 GB of RAM. For the $750 asking price, that’s a lot of RAM; and as a result, you’ll see some great access times and resource management. The processing on this computer is mid-tier; it has an i5, but it’s a few generations old and only has a dual core setup. I think the Flex is a good laptop for those who want to transition into the tablet style of computing, but it does have its flaws. First, when you lay the laptop flat, the keyboard is there too, which I guess you’re supposed to ignore. That being said, in reverse mode, you definitely get a kickstand-style experience that’s perfect for when you’re watching a show and browsing the internet simultaneously. I also think that the sound quality on this product could have been a bit better, but overall it has a good level of quality, especially for the $750 asking price. Our next laptop is a little more premium than the other devices. First, it incorporates one of NVIDIA’s 1000-line graphics cards; this time a NVIDIA 1060, which is virtual reality-ready. This is a great card to have, especially if you want to play games at high settings. Also, it has an IPS panel which provides high-contrast colors and wide viewing angles. Insofar as storage, this product has two hard drives; one a single-terabyte SATA drive with an RPM of 7200, and the other is a solid-state unit that has 128 GB of onboard storage. This is a great combo, especially since the machine has enough space to store your most essential software and operating system on the SSD. I’d want 256 or 512 GB but hey, that can upgraded down the road. The final 14-inch laptop is from the famous gaming brand Razer. This small and svelte system has a lot going for it, including a powerful quad-core processor – the i7-6700HQ, a very powerful GPU – the NVIDIA 1060, and an excellent 16 GB of onboard RAM. With the graphics card, you’ll be able to play virtual reality games and play many of the latest crop of AAA games at their maximum settings. Additionally, the Razer Blade has a one terabyte solid state drive, which is amazing for fast access times and storage. One of the defining aspects of Razer products is its Chroma keyboards, which can be application controlled, have stunning LED backlighting in a myriad of colors, and are very responsive in most games. This laptop has this type of keyboard, which adds a high degree of customizability to your games and applications. The only issue that I have with this laptop is its tendency to heat up a bit under higher workloads, which is an issue that can be resolved with a laptop heating platform. If you are interested, Tech Radar has an excellent review for this laptop. As you can see, opting for a smaller screen does not mean that you have to sacrifice the quality of the laptop that you purchase. I created this guide to help you compare a few of the best 14 inch laptops on the market. The four models that I reviewed above are all great options that you can choose from, and the 14 inch model that you select will depend on your needs. If you a gamer, your needs may vary from a professional who needs the device for work. If you are unsure which specifications work best for you, leave me a comment here. I will get back to you as soon as I can to help you decide which laptop fits your needs.